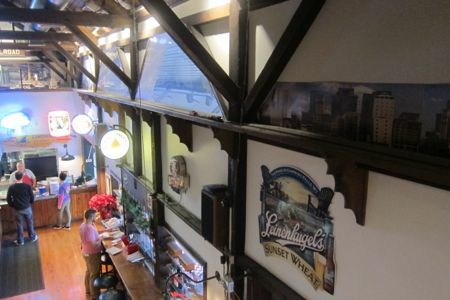 There are approximately 7,245,900 pizza restaurants in Connecticut (+/- 7.244 million). And, as everyone knows, the best pizza in the country is made right here in Connecticut. This has been stated as the fact that it is by several prominent chefs and food writers. Wooster Street in New Haven is great, but really, New Haven style “apizza” has spawned many other places around the state that are reasonable facsimiles without the absurd wait times. Heck, I’ve even got places 10 minutes from my house in West Hartford that fit nicely in to the top 5 in a state with the best pizza in America. I am quite lucky for that and I am appreciative. Especially when I travel or think about my friends who stayed in Delaware where I grew up. I even have several friends who live in Chicago. My heart breaks for them and the goopy slop they have to endure under the guise of “deep-dish pizza.” Truly tragic. This whole regional inability to make good pizza is a mystery to me. It can’t be that hard, can it? I go to Delaware more than anywhere else, simply because my parents and family live there. And as a result, we often go to my kids’ cousins’ birthday parties and whatnot whereupon they are forced to endure what is loosely deemed “pizza.” Again, this just makes me sad for non-NY/CT humanity. We residents are all quite fortunate. As a result of living in such a pizza-rich state, sometimes pizza restaurants have to employ gimmicks to set themselves apart. 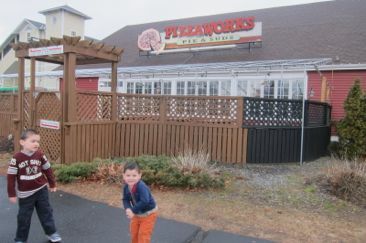 Enter: Pizza Works of Old Saybrook. Old Saybrook is a lovely town, notable as being the former home of one Katherine Hepburn. Her former mansion on the Sound which has been for sale forever. 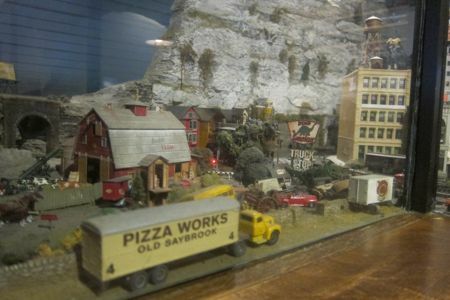 However, Pizza Works isn’t on the Sound; in fact, it’s located in an semi-industrial area by the train tracks. 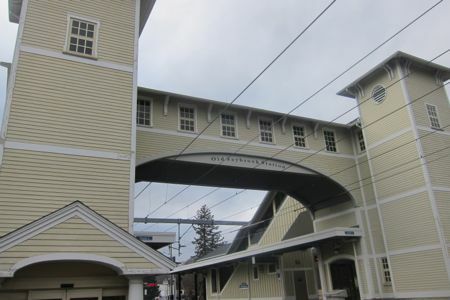 Actually, it’s located right next to the train station itself. This alone is pretty cool, for as you can imagine, little kids waiting for both pizza AND a passing train is brain-melting excitement for them. 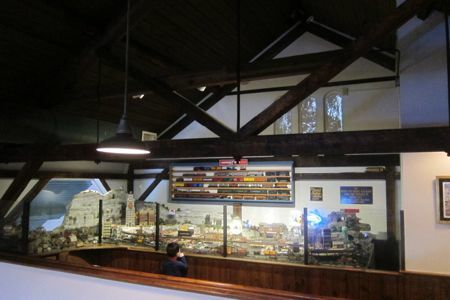 But it doesn’t stop there… as you’ve already been able to discern from my pictures, Pizza Works’ “thing” is a fairly robust model train layout on the second level. The boys thought we were simply going to get pizza in a restaurant. 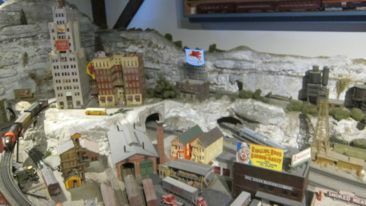 This alone causes them much excitement, so when we were shown to our upstairs seats, past one part of the train layout, they were beside themselves. I ordered a pizza and a salad and let the boys roam free. I don’t think the layout here is based on any sort of real world scenario. 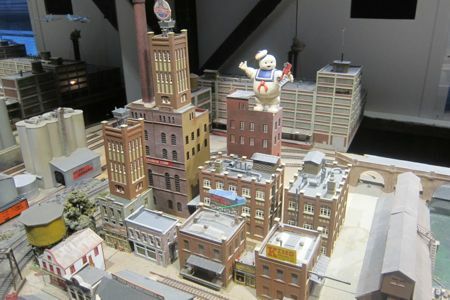 (And no, I’m not just talking about the Stay-Puff Marshmallow Man.) 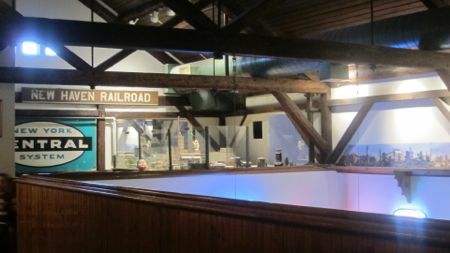 But there are many references to the New Haven Railroad of yore. Oh dear. WHO EATS THIS ABOMINATION?! Not us. Our pizza was fine; nothing insanely good or unique or worth the trip to Old Saybrook for again. 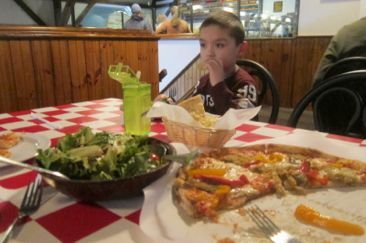 I do recall the salad was above average though and the boys loved the garlic and cheese bread. 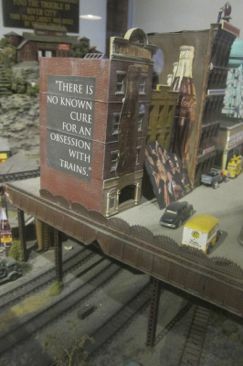 But what they really loved – and the only reason this place warrants a page on CTMQ – was the train layout. 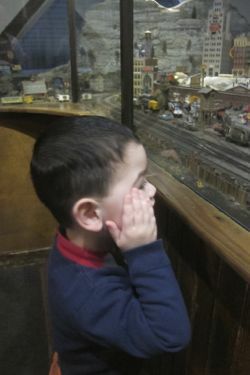 The family at the one end of the restaurant left before we did, so Calvin was able to go over there and stare at the trains in that catatonic state that falls over three-year-olds when they stare at trains. Okay, I think I’ve said all there is to say about Pizza Works. 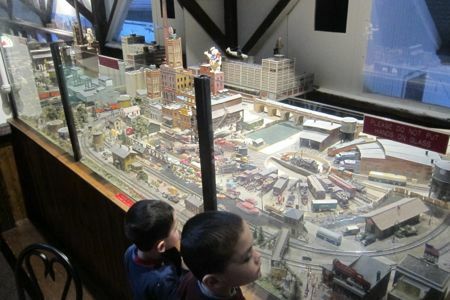 The boys and the trains. Can you see the Stay-Puff Man? No? Well, there he is – a reference surely lost on anyone under a certain age. 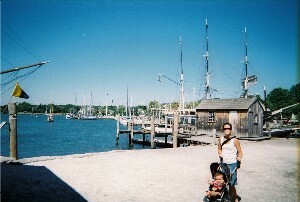 My family & I stay in Old Saybrook for 2 weeks every summer. 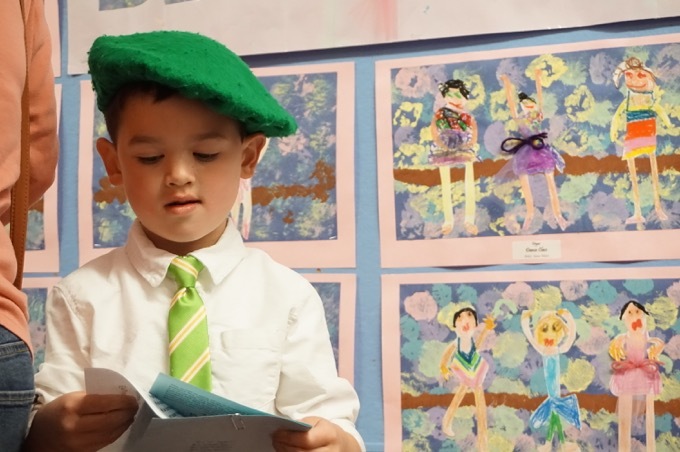 There is one thing that is at the top of our list “to do” while we are there is Pizzaworks! Love the trains, atmosphere AND the pizza!!! !